So the weather has been absolutely shocking and picture-taking a complete disaster the last few weeks which will explain why I haven’t been able to share much in the way of brand new images lately. It’s a bit disheartening when you want to share stuff but it’s so dark, rainy and miserable that all your pics come out grainy. So while I wait for the sun to make an appearance (fingers crossed), I figured I’d just give you a little update on one of the decisions I’ve made on the dining room. The room has been nearly cleared completely of any extraneous decorative items, I’ve sold my white sunburst mirror *sadface* and the sideboard has sold as well and is being picked up on Saturday. The chairs have been dropped off at the upholsterer’s *happyface*. The rug is getting dumped (it wasn’t in any fit shape to be sold or donated). 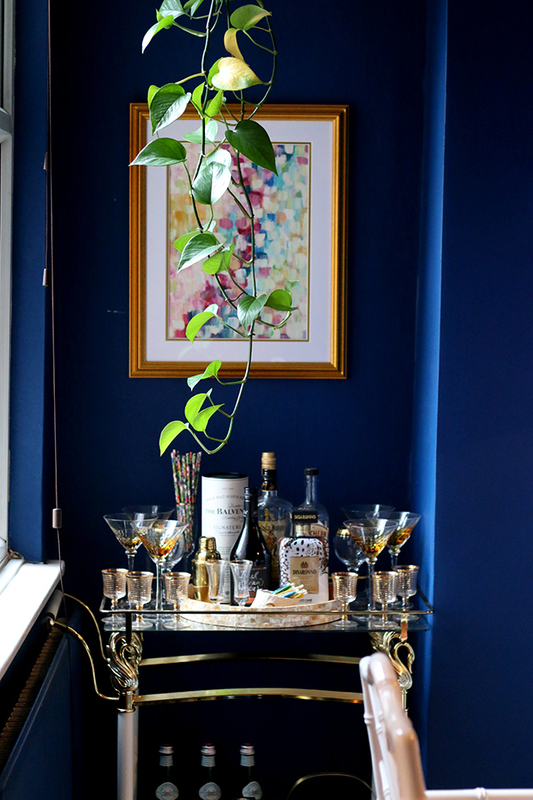 So the room is close to being empty with the last remaining items – the dining table, black console table and bar cart – being moved out on Saturday morning as well to other areas around the house for now. However, in better news, I found my sideboard! Whoop! I initially wanted something low and long as in my original mood board however I realised that was actually a little impractical. One of my goals for this year is to be more transparent with you and sometimes there are factors that you simply can’t get around so here’s why I changed that decision. As you know, we got a puppy last year and one of the first things we did was crate-train him. It’s brilliant in terms of potty-training (and he’s fully potty trained now, hasn’t had an accident in probably a good 3 months if not longer!) and Quito actually quite likes his crate. He sleeps there at night, takes his meals in there and will often just go in there to his little dog bed and sleep with the door open. When we go out, he quite happily goes in his crate to sleep, we shut the door, leave him a little bowl of water and a soft toy and he’s perfectly content until we’re back. At some point in time when he’s a bit older, I’d like to be able to lose the crate completely once we can fully trust him to be on his own when we’re out. But at this point, he’s not *quite* there yet. So the crate has to stay for now. 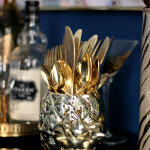 So you may be wondering, what in the WORLD does this have to do with a sideboard? Well, at the moment, the crate is in the dining room although it’s no longer in the position you see it below. 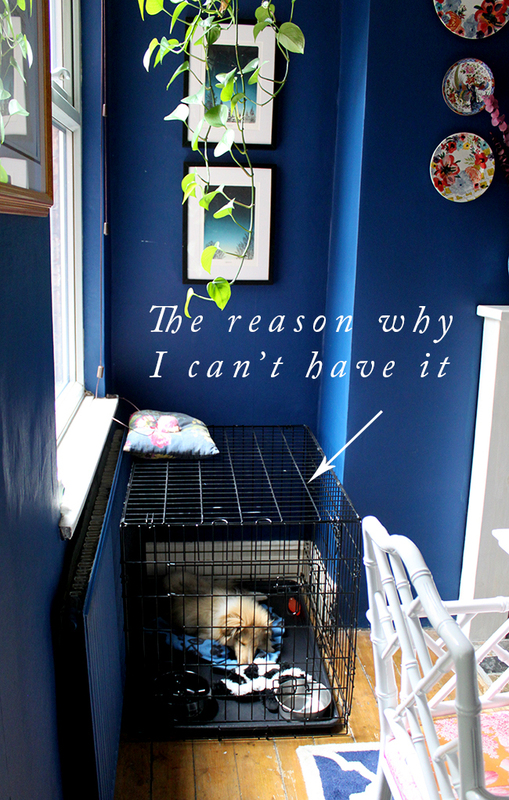 No, it’s not pretty and I normally shift it out for pictures because who wants to see a dog crate in a dining room? No one, that’s who. This is where it originally used to be but I moved the crate to the opposite alcove a couple of months ago and put the bar cart in this corner which I like better because this corner is so much brighter and we felt Quito was probably getting too warm right next to the radiator as the winter progressed. So this is the reality now. Look at that face. I realised if I got a bigger, longer sideboard, the crate would no longer fit in that corner and there isn’t really any other place we can put it. This alcove is wider and so the crate fits nicely against the corner of the room because it sticks out too far in the other one as you can see in previous picture. 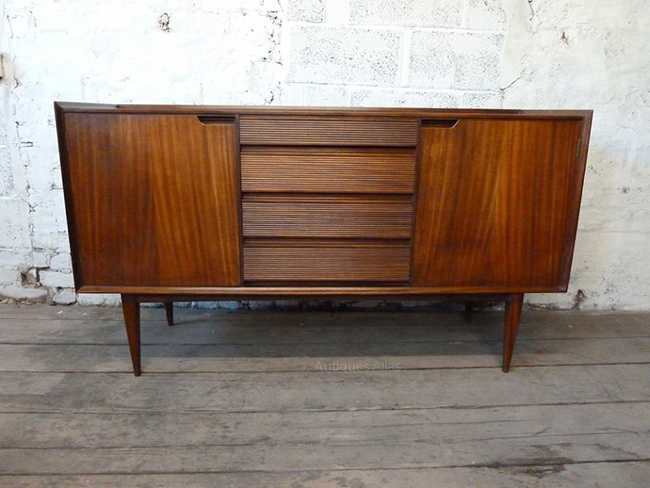 So the search was on for a sideboard that had similar dimensions to the one I had but in a mid-century style. The lovely Karen at Making Spaces, pointed me towards Vintage & Retro & Tings on Facebook and it was there after much to-ing and fro-ing that the lovely gentleman who owns the shop agreed on £235 for this beauty. Isn’t she lovely? It was designed by Richard Hornby, a furniture designer in the 60’s and sold through Heal’s and is made from African Teak. Turns out, African Teak (or Afromosia) is currently on the endangered list so furniture is no longer being made out of this particular wood – all the more reason to treat it as precious! I’ve seen the same one on other sites going for around the £450 mark so I got a very good deal! The colour is perfect, it’s in amazing vintage condition and while the price was slightly higher than I’d initially budgeted, I couldn’t resist putting a deposit on it for them to hold on to it until I was ready for delivery. It’s the perfect size – slightly longer and lower than my current one but not too long to still fit the crate at the side for the time being! I mean, I could have just said, ‘sod the dog!’ and got the low, long, lean number but the truth is, I love my dog and I want him to be happy and sometimes you just have to make some compromises for “family”! Even if it does mean having an ugly crate in your dining room for a little while longer. Have you had to design ‘around’ anything you’d prefer not to? 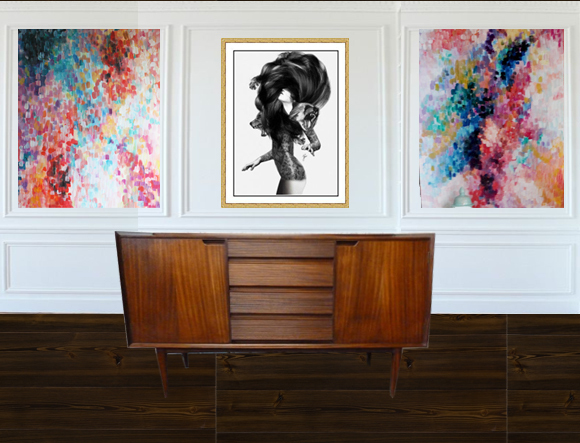 What do you think of the sideboard? Let me know what you’re thinking! I think your compromise has ended up being a fantastic choice! 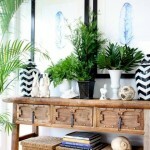 What a lovely sideboard indeed – it’s beautiful! I know exactly what you mean on compromising for pets – I have a regular dilemma regarding he siting of the cats’ litter tray. It is just an ugly horrible thing no matter where it is or what you do with it. I must think of some clever hack to get it to work better but I’ve not found the solution yet! Really excited to see the big reveal in due course though! Good lord that’s a beautiful sideboard, LOVE IT! I think my own vintage sideboard (used as my tv stand) is my favourite ever piece of furniture. No idea where/when it’s from but I got it for €50 in a charity shop with only a minor altercation with another interested party so that’s fine by me! And I feel you on the designing around non-pretty things, I try to keep kid-paraphernalia to a minimum or at least have it in non-offensive colours but I still find myself moving boxes of toys and high-chairs out of photos all the time! I also detest radiators! I keep having to compromise on what I want to do in rooms because there’s a stupid radiator in the way. Under floor heating is on my wishlist for our forever house. Do you just paint yours with the same paint as the walls or is there a special way of going about it? I’m a new follower although I did follow you during your office makeover. So glad I did especially since you are explaining the why behind the what you do, design-wise. Our pup came to us crate trained by my mother in law who raised dogs. She explained it was his little bedroom and he tucks in there to feel comfortable and safe. I’m more comfortable leaving him in the crate while away since our adult kids have keys and come and go whenever. It feels safer knowing he won’t accidentally get left outside or mark the drapes by the front window if he’s mad at the delivery guy (whom he hates). You may want to let your pup keep his little bedroom, after all. Luv the lines on your gorgeous buffet. I grew up with this kind of furniture. 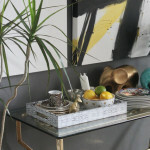 love the new sideboard! it’s gorgeous! 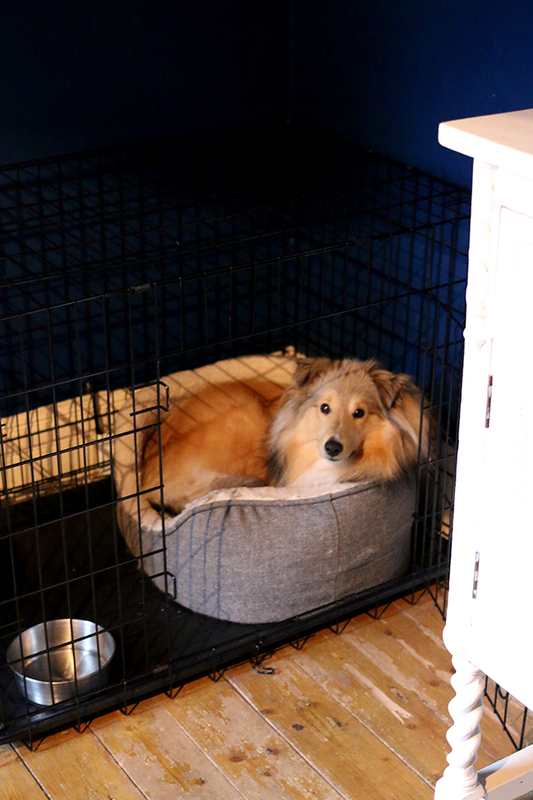 and yep- our dining room has 2 dog beds and a small crate… so lovely. Oh, I love it! Maybe even better than the longer one. And, Quito is so precious. 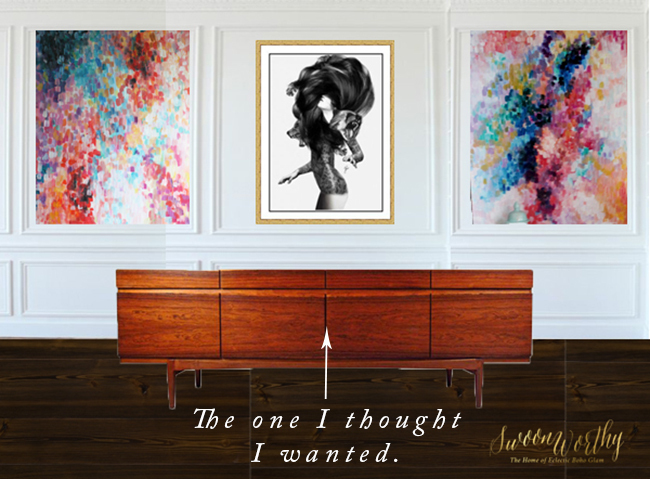 Of course we have to include everyone in the family when we make decisions about the home. It’s real life, right? Sending you some virtual sunshine from South Carolina! Quito is so chuffing cute? its brilliant how you are decorating with his comfort in mind. To us that love having pets in the home its second nature, you wouldnt do anything different. I always encourage clients to use a crate. My Collie Shelby recently fractured her front leg badly requiring several weeks of restricted movement. The fact that she is crate trained and happy there made her recovery so much happier for all of us. 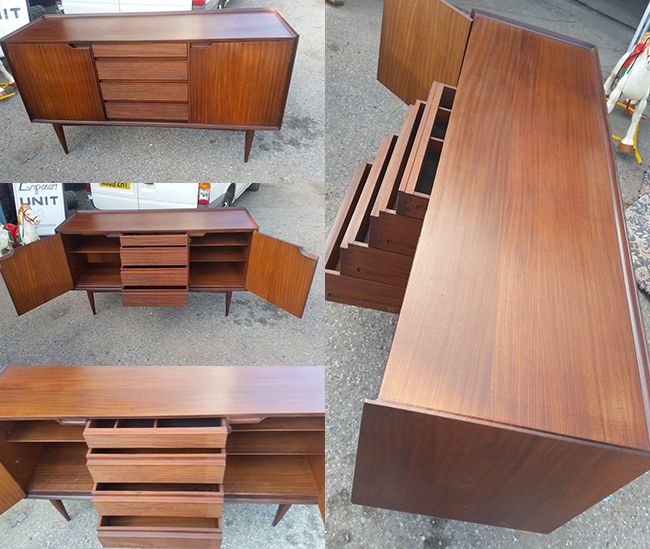 I love the quality of that sideboard and have now checked out the supplier as they are just down the road from me. Thanks for another great lead. Can’t wait to see the finished dining room. My dog is 5 and we still have his crate because he loves it! I sewed a cover for it to try and make it blend better (it doesnt) but I think it made my dog love it more. It’s his dark den in there. 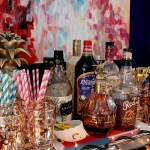 I love the new sideboard! The grain of that African teak is absolutely dreamy! And I’d say the price you got it for was such a deal!